Happy February friends! I took some time off from my blog to rest and refresh my mind and home…so that I can be a better me for my family! And all month I was in the “ORGANIZING” mood! Do you like to organize ALL the THINGS in the new year? Last Fall, I cleaned out our pantry…it’s like a breath of fresh air to have it organized and tidy so we can find what we need (I’ll share the pantry another day). We have a rather small kitchen, so when things are cluttered or in chaos, I feel stressed. Now, I don’t mean messy. Our house gets “messy”…because we live here. But when there is not a place for items, I feel like I’m shifting things from one area to another. So, I thought I’d share with you how organizing a small kitchen can be easy, and possibly inspire you to organize too! First off, I try to continually get rid off things we no longer use…I found a Fry Daddy hiding in the back of the cabinet (anyone remember those??) and sent that to Goodwill, because we haven’t used it in years. This just creates more space to house the items we use regularly and that makes me happy! Now, I did watch a few episodes of the Marie Kondo series…isn’t she the cutest? I think she’s got a great idea in keeping things that spark joy. I also love the folding idea. However, I would rather thank God for giving me the ability to purchase the things we bring into our home. I love the verse, “for where your treasure is, there your heart will be also” Mat 6:21. And man, don’t we fill our homes with many treasures?? I just want to be more thoughtful this year on what I bring into my home…whether it’s needs or wants. If it’s not being used or serving a purpose, I don’t want it taking up space. When you have small spaces, like our kitchen…it’s even more important to be thoughtful with storage. We had this hutch built when we remodeled our kitchen. Although it appears to be a movable piece, it’s actually a built-in. And with open shelving, I want it to be functional, store pieces we need to reach easily, and look pretty. So, I keep our ironstone bowls, mortar & pestles, and some copper pieces here for easy access. 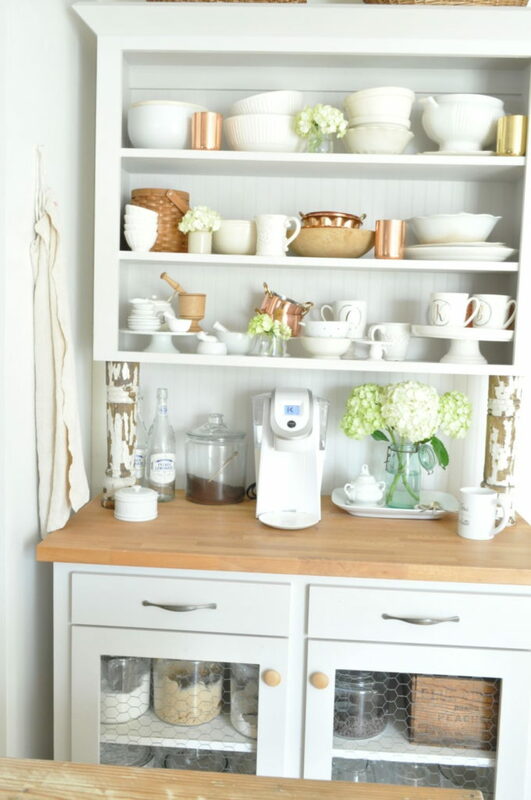 It also serves as our coffee station, so the mugs are stacked all over the lowest shelf…and I fill extra bowls with Keurig coffee pods, because they won’t all fit in the drawer. This way it’s user-friendly, and looks pretty. The bottom area is where I store our dried goods…flour, sugar, oats, powdered sugar, brown sugar in small CLASP JARS LIKE THESE and these LARGE JARS WITH LIDS. It’s so easy to reach these being right here on the bottom shelves, and the kids know where everything belongs. Isn’t it nice to create storage that everyone can pitch in and help clean up?? 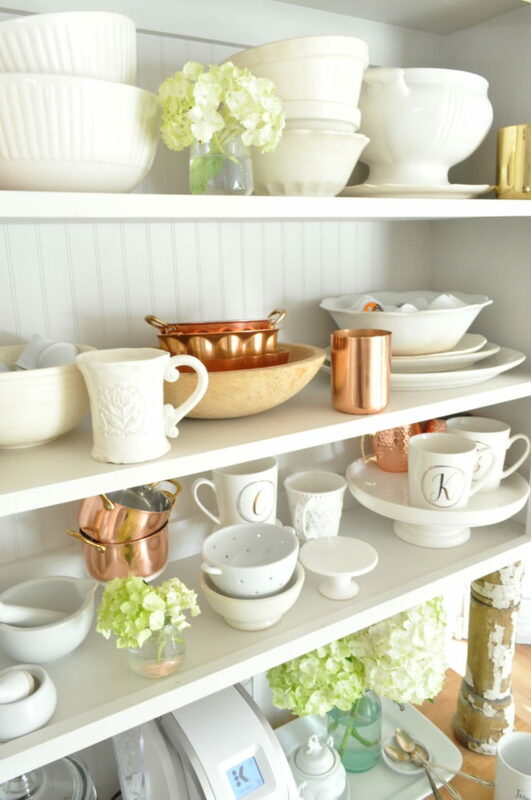 One piece of advice I’d give about keeping a cohesive look throughout your kitchen…is to purchase one color of dishes. This way, no matter how you store them- displayed on open shelving, or in a cabinet, it pleasing to the eye and looks clean. One of my favorite things about our island is this large open shelf. 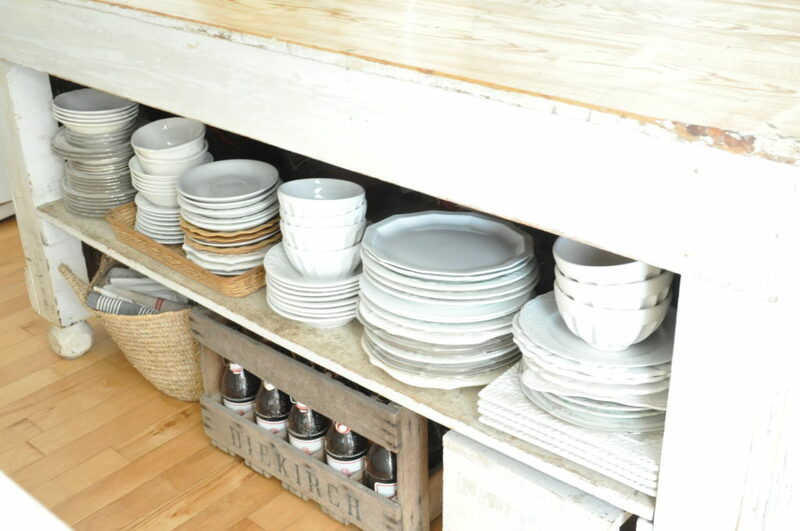 We store our daily dishes here, which makes them easily accessible and simple to put away. I keep a step stool under the island, along with a basket full of folded dish towels. We have only a few drawers in our kitchen, of which are used for utensils and silverware. So, this MARKET BASKET (found in my shop here) is perfect for storing the towels under my island. It’s near our sink, so it’s in easy reach as well. 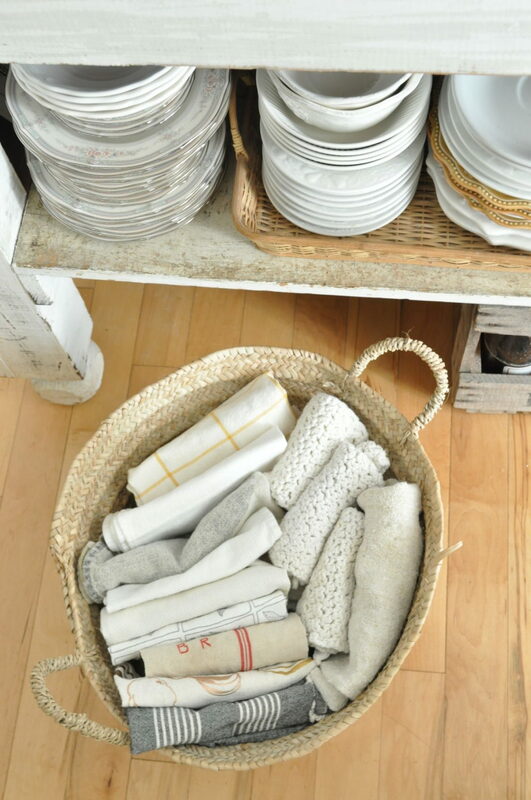 Baskets are great storage pieces for the kitchen!! I don’t have all matching spice jars yet…THIS IS A SET I’M WANTING to purchase SOON, and THIS SET IS A GREAT PRICE!! However, I use THIS TIERED LAZY SUSAN to corrall spices and they’re easy to find. 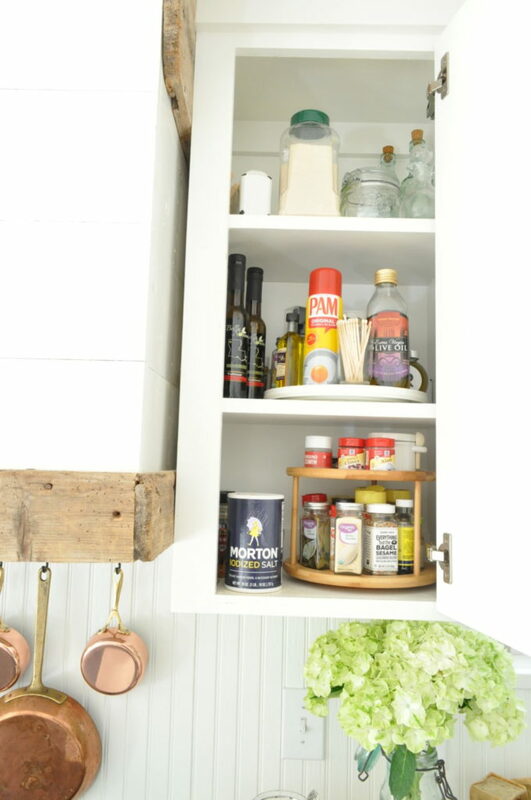 For other items, like oils and matches… I love using these white LAZY SUSANS in cabinets! And this MARBLE LAZY SUSAN would look amazing on the countertops! I just have very limited countertop space, so most of my items are in the cabinets, hidden away. 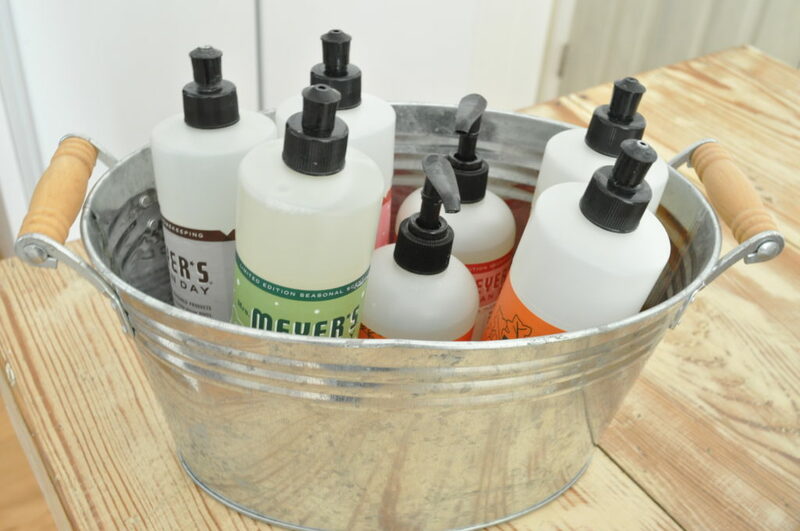 I also love to STORE MY FAVORITE DISH & HAND SOAPS in these cute GALVANIZED BUCKETS that store easily under the sink. I just pull them out, and get what I need. And my favorite way to store dishwasher detergent pods is in these GLASS JARS With SCREW on lids. 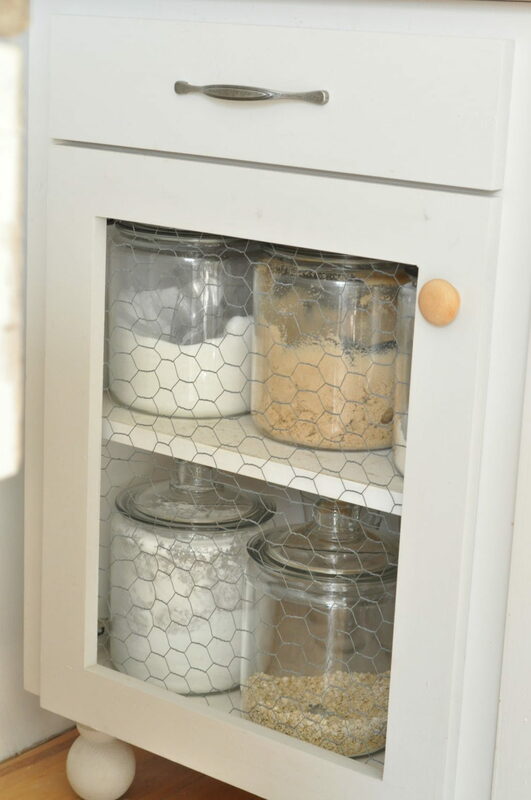 So, I love sharing my small kitchen storage solutions with you…and I have another post coming soon on our organized pantry, if I can be brave enough to show you (cuz it’s ugly). If you perhaps have any other ideas, please share in the comments with me. I love to hear how others use their spaces creatively. And I have several affiliate links above. Thanks so much for supporting my blog and visiting me here! I’ve used lazy susans’ for my spices for many years!! It looks lovely! You are right, Marie Kondo has excellent ideas…. I have incorporated her inspiring ideas…folding for one and have been going through the house purging and organizing for a while. And when I go thrifting or shopping, I find I am much more careful and aware of what I bring into the home.